Lovely detached Cornish granite cottage, sleeps 4 in a double and a twin, light and airy with a sunny patio. In a quiet lane but close to Market Square and beautiful fields. 1 mile from Cape Cornwall and South West Coast Path. 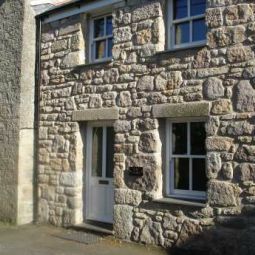 1 Bethany Place is a lovely detached Cornish cottage built in approx. 1840 and located in the picturesque town of St Just in Penwith, known as the most westerly town in England. The cottage is wonderfully situated, being quiet and relaxing yet conveniently near to all of the amenities. No more than a minute's stroll from the cottage at the end of the lane is the Market Square with all its lovely shops, creating the very heart of the town where everything happens. At the other end of the lane, even closer, it leads out onto open farmland with lovely views into Nancherrow valley. 1 Bethany Place is fully equipped offering 4 persons (1 Double & 1 Twin Bedroom) a very comfortable and quaint environment to relax and enjoy West Cornwall with all of its stunning beaches, views and attractions. We also welcome your pets and the surrounding area offers you magnificent walks. Take the A3071 from Penzance, arrive in St Just Market Square. 1 Bethany Place can be found down the lane next to the butchers shop called McFaddens.